I read this recipe a few days ago and have been craving the muffins ever since then! I am not even a big muffin fan but the cinnamon and sugar and butter ... I needed them! But of course it took me days to track down all the ingredients. And even then I had to sub out tapioca starch for potato starch because I can't find anything but tapioca pearls in my stores. I've started writing down common ingredients that I find in recipes because it looks like a big online order is necessary. I don't think my muffins are as pretty as Ginger Lemon Girl's. 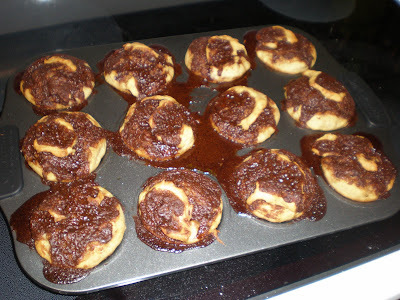 I should have stirred the cinnamon mixture in more. But that aside, they taste amazing!! I ate one after supper and was a very happy little girl! Gave one to my father, who has zero understanding of my new diet no matter how many times I've explained it all, and he said it was fantastic. I am giving you the recipe as I made it tonight- just slightly different from the original. * In a large bowl, whisk together dry ingredients. * In medium bowl, whisk together wet ingredients, minus two egg whites. * Whisk together wet into dry ingredients. * Fold egg whites into mixture gently. It's OK if you still see a few white streaks. * In small bowl, melt butter in microwave. Add cinnamon and sugar and mix well. * Spritz 12 muffin tin with non-stick spray. Fill each muffin cup half full with mixture. 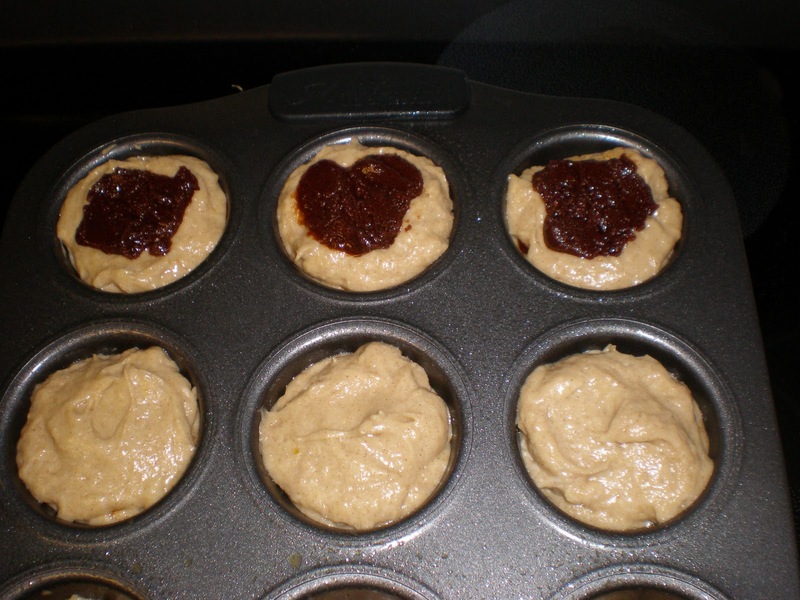 * Add 1/2 teaspoon-ish of the cinnamon butter to each muffin cup. Stir a bit with a knife. 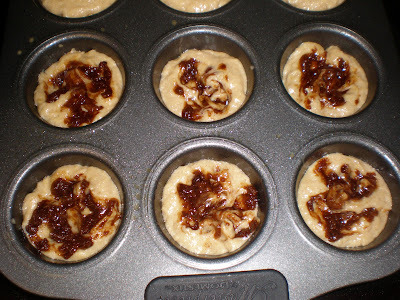 * Fill the muffin cups with the remaining mixture. Top with remaining cinnamon butter. Mix a bit with a knife so that you get the yummy cinnamon in each bite. * Bake for 18-22 minutes. Cool on wire rack. oh my goodness those look delicious! I definitely have to try this recipe! those look delicious but am curious about some of your ingredients. Xanthan gum? You asked about xanthan gum. Its actually in lots of foods like salad dressings and such. But in GF baking it is almost always used as it adds the desired stickiness to doughs that is hard to come by when you omit wheat glutens. It just helps things react more like gluten-full products. It's sold in the same shelf as all the GF/organic products and you only use a small amount. Hope that helps. I just started down the GF road so I am learning as I go... You could certainly make them with regular flour instead of all the crazy flours and the xanthan gum listed. Oh my yumminess! I'm making these ASAP. Now I am craving them. And I wasn't even hungry before seeing the post. Uh, yes please. Those look fallish and amazing! hmmmmmm... i luv anything cinnamon! looks decadent! These just made me drool on my keyboard! Wow, this sounds SO good! I'm blog hopping from Kellyskorner. Am now following! Would love for you to check out my blog and follow back!